A Sasquatch parenthetic here. The documentary "Shooting Bigfoot" will televise on British channel BBC4 this Monday (24th March) at 9pm. "Shooting Bigfoot looks into the religiously obsessive, competitive and bitterly divided cult of Bigfoot hunting, as filmmaker Morgan Matthews accompanies three American Bigfoot search parties trying to capture proof of the elusive ape-like creature. Tom Biscardi has been hunting down Bigfoot for 37 years and adopts a military approach with his 'A team' of guys armed with thermal imagers and tasers in increasingly far-out attempts to capture the beast. Unemployed Dallas and Wayne in Ohio use more basic techniques, utilising cans of mackerel and Native American chants to lure the creature in. Only renowned 'master tracker' Rick Dyer is intent on shooting and killing the mysterious beast as he stakes out a stretch of woods in Texas populated by homeless people, many of whom claim to have seen Bigfoot. As truth and fact tip into malarkey, night-time hunts devolve into farcical displays of voodoo and comic stretches of the human imagination. What starts as a humorous look at perception gone off the rails, descends into a dark mystery as things get out of control during a close encounter in the woods." This should shed some light on the Rick Dyer controversy ... I hope. YouTube trailer is here. I just watched the program and it is intriguing to say the least. My assumption was that something was shot dead in the footage but that does not appear to be the case. Something was shot at, but no body was filmed. Morgan Matthews claims Dyer went back and did that. However, there is footage in the dark of something humanoid and hairy moving away with its back to the camera as Dyer races after it. Whilst Matthews holds back, something with a fleeting, hairy face lunges at him and knocks him to the ground and is seen walking away as Matthews is left in a daze. Man in a hairy suit or Sasquatch? Matthews won't say and the film is not detailed enough to decide, it is too dark. Anyway, puts me in the mood for my planned night hunt at Loch Ness next month, except I won't be packing a rifle! Paul Cropper sent me an interesting article from 1934 on the Loch Ness Monster as it was covered abroad. Paul himself is focused on more antipodean cryptids such as the Yowie, but he occasionally sends me anything he finds of Nessie interest. So, thanks again, Paul. The article itself is from the Californian Fresno Bee publication of March 4th 1934 and is a syndicated article from London. 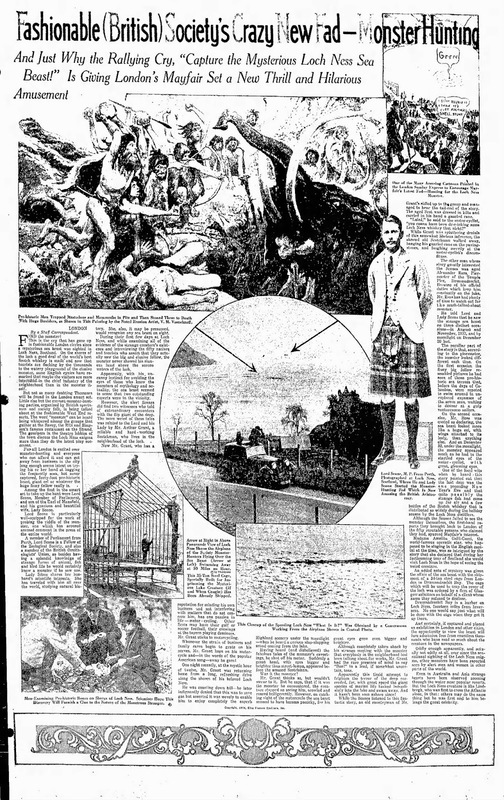 I am not sure if you can read the article (click to enlarge) but the gist of it concerns a monster hunt, the Arthur Grant land sighting and a few more sightings. The man in the kilt is Lord Scone, Member of Parliament and son of the Earl of Mansfield. Since we are told that the Loch Ness Monster was the talk of the Upper Classes and Lord Scone was a Fellow of the Royal Zoological Society, he was the perfect man to cover as he headed north to seek out the monster for himself. Though he never caught sight of our famous beastie himself, Lord Scone apparently interviewed upwards of fifty locals and tourists who had claimed to have witnessed the monster in its various aspects. We are told about Alexander Ross, the master of Temple Pier, who saw the monster on three occasions the previous August, November and December. But the piece de resistance was the famous (or infamous) Arthur Grant, who had seen the creature cross the path of his motor cycle earlier in January at the midnight hour. The picture below from the article says "Men examining prehistoric bones on shores of Loch Ness", but this is complete nonsense. The man on the right I would suggest is the now notorious Marmaduke Wetherell who was around during the Arthur Grant event, conducting his own search for the Daily Mail. Wetherell went to the location of the land sighting and examined some bones found at the site which were no doubt nothing more interesting that those of a sheep or similar. The photo below gives some context to what I am saying. Clearly, the author of this article is being economical with the truth and he further embellishes Grant's account with stories of eyes bigger than street lamps and roaring belligerently. What was most interesting was the article's talk of the "Society Monster Hunters" and a photograph of them flying over the monster swimming away at "30 miles per hour". We are pointed to the plane with the right arrow and the monster in the loch with the left arrow. Who is this mysterious organisation and what is the provenance of this photograph? Things get stranger when an enlargement of the creature is provided in the next photograph below. On closer examination this turns out to be the Malcolm Irvine film of December 12th 1933. This is the first ever alleged motion film of the creature, but all we have left now is this still. However, Irvine claimed he took it from a hillside opposite Urquhart Castle on the other side of the loch. Clearly, this one is alleged to have been taken from a road by the Castle. But when I saw that picture of the plane, beast and castle, I thought "Where have I seen that picture before?" and a look at Nicholas Witchell's "The Loch Ness Story" revealed the photo below (page 73 of the 1974 edition). It is the same photo, but a close examination of it showed no plane and no monster! Overlaying the two pictures confirmed there is nothing at the same location on the original picture. The photo had been retouched to give the impression of a plane flying over a monster in the loch. It seems the editor of this article was not prepared to wait for the arrival of Photoshop. Note the monster hunter in the car is not even looking in the direction of the "monster"! What are we to say to these things? Shoddy journalism in search of a bit of sensationalism is nothing new. I doubt this particular article had any big effect on the overall scheme of things, after all, who today knows about this alleged photograph? But in the light of my recent modern folklore article, here we see the modern storytellers adding their cultural layers of "interpretation". Eyes like street lamps, roaring monsters and the mysterious band of "Society Monster Hunters" all were added to the mix and copied across various countries to present a picture of the monster which lacked the realism of what the witnesses claimed to have seen. Fortunately, not all recorders of cryptid history are so fast and loose with the facts. But it is to be recognised that one has to sift and assess to a certain degree, though certainly not to the degree that everything is tossed into the bins of hoax or misidentification. The Loch Ness Mystery is much more subtle than that simplistic approach.